He was born into a Maronite Catholic family and wrote his best known work in English, but Kahlil Gibran was subsequently embraced as a symbol of Arab culture. 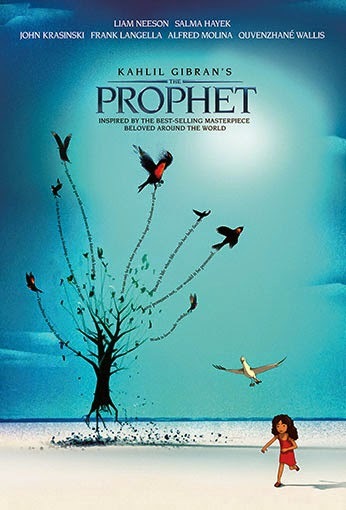 Without question, his best known work is The Prophet, arguably the original break-out New Age bestseller, whose celebrity admirers include Elvis Presley, John Lennon, and Salma Hayek. Her regard for the instantly recognizable Knopf title was such that she produced a big screen animated adaptation of the book few would have thought adaptable. The ambition and animation are definitely impressive, but the source material remains unwieldy in Roger Allers’ Kahlil Gibran’s The Prophet (trailer here), which screens during this year’s New York International Children’s Film Festival. In order to give the film a central storyline, Allers took some liberties with the framing device. The exiled prophet Mustafa (here more of a hipster painter and poet) is indeed bidding a fond farewell to the citizens of Orphalese, but he will not simply hop on the tall ship and sail off into the sunset. The oppressive Pasha and his thuggish police sergeant are planning permanent measures to halt his progressive influence before they let him go anywhere. The resulting narrative is like a weird passion play, with the assorted peasants in the countryside and merchants in town celebrating his presumed release with much feasting and drinking. At each stop along the way, Mustafa gives the crowd a pithy bit of prose poetry wisdom that are impressionistically rendered by a diverse roster of animators. No longer is Almitra a seer. She is now the rebellious mute daughter of Kamila, the widowed housekeeper hired to tidy up the prophet’s exile cottage. Sharing a connection with the island’s seagulls, she is the first to suspect the fate awaiting Mustafa. Presumably, these liberties taken with the text pass muster with the Gibran establishment, given their active role in the production. Regardless, the film as a whole is necessarily uneven, since Allers and Hayek-Pinault (as she is billed here) deliberately embrace its episodic structure. Not surprisingly, the best sequences are “On Love” animated by Tomm Moore (Song of the Sea) and “On Marriage” crafted by Joann Sfar (The Rabbi’s Cat). The abstract nature of the texts are also particularly well suited to the styles of Nina Paley (Sita Sings the Blues) and Bill Plympton (Cheatin’). However, the other four parables largely blend together. Following in the footsteps of Richard Harris’s Arif Mardin-produced musical interpretation of The Prophet, Liam Neeson continues the Irish Gibran tradition as the voice of Mustafa. To be fair, his husky, reassuring tones are rather well suited to the film. Hayek-Pinault is perfectly serviceable as Kamila. (Since she is once again playing a mother facing difficult circumstances, Prophet should really be considered a companion film to Everly and the two should be screened together whenever possible). Quvenzhané Wallis gets precious little actual dialogue as Almitra (but perhaps that is just as well), while Alfred Molina does his best to keep up with the slapstick humor directed at his pompous Sergeant. Whatever you do, always observe the authorial possessive in the title, like “Bram Stoker’s Dracula.” Although the film’s cultish impetus is a little creepy, it is intriguing to see such a high profile attempt at impressionistic, non-narrative animated filmmaking. Unfortunately, some of the contributing filmmakers are better suited to the task than others. 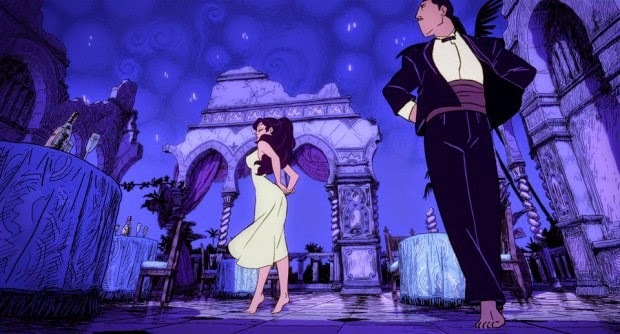 A strange hybrid, Kahlil Gibran’s The Prophet is recommended for animation enthusiasts who want to see something a little outside the norm (whereas younger viewers will probably find it indulgently lecture-y) when it screens again today (3/22) at the DGA Theatre, as the closing film of the 2015 NYICFF.